Advance Tabco SLD-3 Stainless Steel Free-Standing Bar Drainboard - 36" x 18"
Prep all your favorite beverages and more with this Advance Tabco SLD-36 stainless steel free-standing bar drainboard. An embossed and seamless drainboard boasts a 1" IPS drain, and is fitted with a 4" backsplash. Both features serve to keep users safe by reducing the potential for wet, slippery surfaces immediately around the unit, which ensures a safe and comfortable environment for your bar staff. In addition, it is designed for exceptional durability and years of high volume use thanks to sturdy construction along with adjustable side cross-bracing. 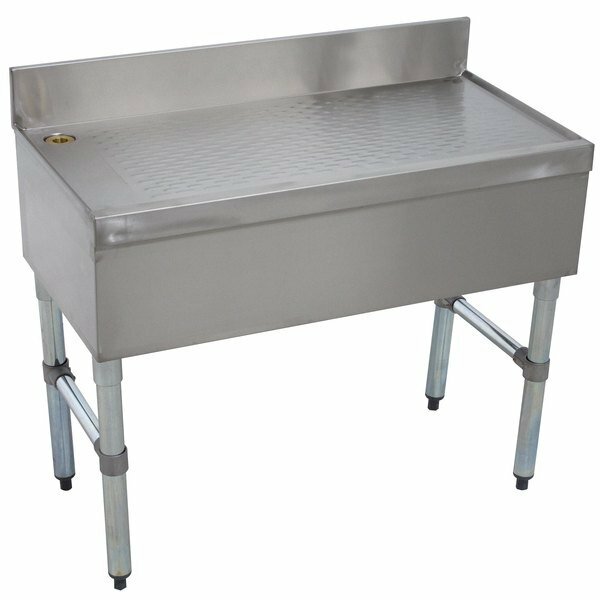 The Advance Tabco SLD-36 free-standing drainboard is the perfect addition to any commercial kitchen or foodservice operation.